Beverly Hills, CA- Following an announcement that The Academy of Motion Picture Arts and Sciences is considering the HBO documentary Paradise Lost III : Purgatory, as one of 15 submissions being considered for an Oscar in the documentary category branch of AMPAS, chaired by Rob Epstein- Todd and Diana Moore took action. The Moores are the parents of James Michael Moore, one of three eight your old victims murdered on May 3, 1993 along with Chris Byers and Stevie Branch. Within days of an exclusive series on the murders appearing on www.blinkoncrime.com which included the discovery of potential new evidence; the nearly 18 year old case that resulted in 9 previous convictions of three suspects took a radical turn. On August 19th Jessie Misskelley, Damien Echols and Charles Jason Baldwin pled guilty to the murders of all 3 children via an Alford plea and were immediately released from jail as convicted murders on parole. Paradise Lost III produced by Joe Berlinger and Bruce Sinofsky follows it’s predecessors I and II, released in 1996 after the initial convictions of the West Memphis 3. Berlinger is a member of AMPAS, and has produced several unreleased documentaries of Hollywood A- listers including Charlize Theron, Hugh Jackman, Oprah Winfrey and Cameron Diaz. Jonesboro, AR- In a shocking development, four days following the first installment of the West Memphis Three on www.blinkoncrime.com, on August 19, 2011 Damien Echols, Charles Jason Baldwin and Jessie Miskelley, through an Alford plea, were convicted of three counts of first degree murder following an agreement made by Prosecutor Scott Ellington and their respective defense attorneys for the murders of eight year old boys James Michael Moore, Christopher Byers ( Murray) and Stevie Branch. Judge David N. Laser agreed to and imposed suspended sentences for time served to Echols, Miskelley and Baldwin; all were released and immediately declared their innocence during the ensuing press conference. In Part I of our series, we touched briefly on the development of new evidence and possible murder weapon, the blue handled- mountain ice axe, which inexplicably was never presented at trial. It had been admitted into evidence after being retrieved from its owner, following it’s return by Jason Baldwin’s, younger brother Mathew. Requests to confirm whether or not the ice axe was maintained in evidence at West Memphis Police Department were non-responsive at the time of this publication. Part II continues first with what the jury never heard. A podcast of my interview on the case following the release of the WM3 can be found here. One of the larger points of contention in the murders was the lack of blood evidence at the scene. The lack of blood or blood spatter at the scene with such gruesome injuries spawned the defense theory the ditch was a dump site or secondary crime scene. This was largely due to the fact that the jury would never hear about the results of luminol tests; it was suppressed by motion of the defense In both trials. Luminol enhanced chemiluminesence (LCL) technology in 1993 was geared toward examining items of evidence in a lab under black light for optimum photographic results, or its secondary application for use in an enclosed environment which can be manually darkened and a portable black light ( we now call this an alternative light source or ALS) brought to the scene. LCL when sprayed onto a surface containing remnants of blood, or more specifically the iron in blood, will create a glowing reaction when iron, invisible to the naked eye, is present. In 1993 under Arkansas law, Luminol testing was considered new, novel, and not accepted as scientific evidence. While the methods for collection, testing and controls have advanced significantly since 1993 and LCL testing is widely used in criminal case work, analysis of the findings in the instant case flatly dispute the notion that there was no blood associated with the crime scene along the ditch bank of Robin Hood Hills. Contrary to the misconception that there was no evidence of blood at the scene, the results of two consecutive days of luminol tests at the scene were enlightening. Jonesboro, AR- In a statement released Thursday, new judge David N. Laser announced an unscheduled hearing in the case of The West Memphis Three. 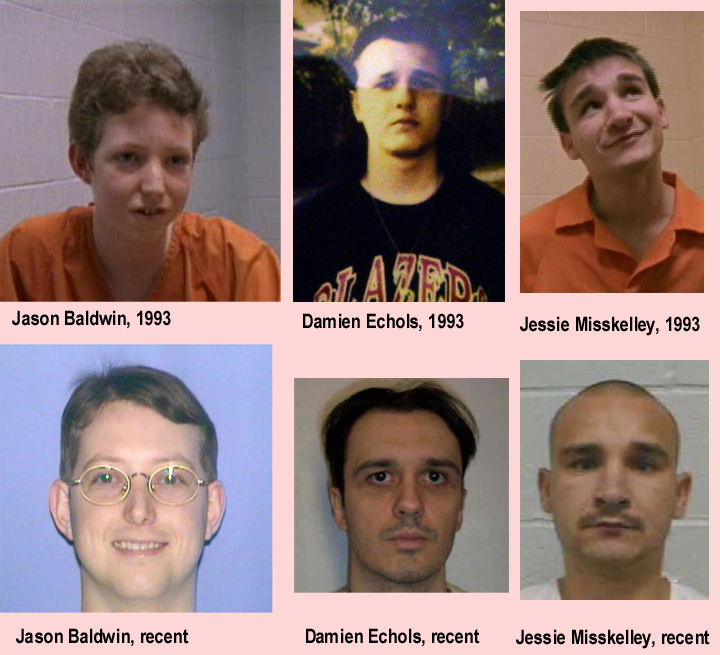 Damien Echols, Charles “Jason” Baldwin and Jessie Misskelley have been incarcerated for 18 years for the murders of Stevie Branch, Michael Moore, and Chris Byers. Speaking on the condition of anonymity to www.blinkoncrime.com, a source connected to the West Memphis Police Department has confirmed that Damien Echols and Jason Baldwin have already been released from the Arkansas Department of Corrections; Misskelley has not. Echols, Baldwin and Misskelley, along with their families, and the families of the victims, are expected to attend today’s hearing. Check back to www.blinkoncrime.com for this developing story. The West Memphis Three Series Part I: Set Free Or Where They Should Be? West Memphis, Arkansas- On Wednesday May 5, 1993 three eight your old cub scouts and best buds Michael Moore, Stevie Branch and Chris Byers ventured into the RobinHood Hill Woods after 6:30 PM. While their worried parents made numerous calls to police and actively looked for them in the area into the late evening, there was no sign of them in spite of neighbors going door to door. Unfortunately there was a shift change at the West Memphis Police Department, and no detectives were called in until the following morning. That critical error by the WMPD is the start of a voluminous list of mishaps and negligence that would plague this case from the onset, and quite possibly earn Damien “Icky” Wayne Echols (a/k/a Michael Wayne Hutchison) Charles Jason Baldwin, and Jessie Lloyd Misskelley, Jr, a new trial. In the interest of disclosure, I am admittedly a big fan of Johnny Depp and Eddie Vedder and I wanted nothing more than to let them know they could count me in as the newest advocate for “free west Memphis 3”. At the onset of my research, I thought it was pretty clear that there absolutely was juror misconduct in the Echols/Baldwin trial, which has yet to be ruled on for the defense team, and I agree that the same judge who heard the instant case should not have heard the appeal, especially in a capital case. As a practical matter, lawyers, specifically defense attorneys, are charged with extracting the “guilt or innocence fact” as it relates to the crime and zealously defending their clients rights and presumption of innocence. Conversely, the prosecution is charged with presenting a case they believe will result in a conviction of the indictment as presented, while adhering to the rules of criminal procedure under the Arkansas supreme court. I think it is a fair statement to say that in both trials, neither endeavor was accomplished and we should all be uncomfortable with how it could threaten our collective rights under our constitution should it go unaddressed in general, and not just in this case with these defendants. The larger issue at hand, is changes to DNA statutes and the states plain language misapplication of the “actual claim of innocence” under rule 37. Simply put, it means that the new evidence, testing, the evidence of any jury misconduct, when evaluated with all other evidence both inculpating and exculpatory whether or not it was presented at trial, is a second bite of the apple- FOR BOTH SIDES. The burden, however, is on the defense to argue that a new jury would likely acquit all three based on the totality of that evidence today. It should be noted that the Supreme Court will rule on this hearing as to whether or not a new trial is warranted giving EQUAL weight to direct, physical and circumstantial evidence, which is also the charge to a jury. I support the hearings to begin December 5, 20011, with cameras present because I believe in transparency and the law is clear that it provides for “higher burdens” in capital cases. I purposely studied trial transcripts pleadings and filings in advance of all actual evidence and exhibits because I did not want any basis I had for procedural errors to influence my opinion. My advance apologies for those reading that are new to the facts of this case for leading with the caboose, there is a method to my engineering. To an extent, I can bifurcate the issues of guilt or innocence vs. our rights under the constitution to due process. I am less open to it given the recent verdict in the murder trial of Casey Anthony, where the similar problem but different verdict of no direct physical evidence tied to the accused resulted in her jury acquittal, but that is not the only topical comparison one can make between these two cases, more on that in the final installment of this series. The HBO Series Paradise Lost, a documentary filmed by Joe Berlinger & Bruce Sinofsky’s company Creative Thinking International with the full participation of both the prosecution and the defense, paid for a portion of the defense of Echols and Baldwin directly to their lawyers and to them by way of a trust in the name of their attorneys. Once the victim’s families learned of this, each of the victim’s families was paid an undisclosed honorarium for their participation in 1994, prior to its airing in 1996. Although Baldwin and Echols benefited financially from the arrangement, they sued their attorneys Dan Stidham and Val Price for ineffectiveness of counsel and conflict of interest. Loosely translated, they have accused them of not hiring defense expert witnesses and well, ineffectiveness. It is due to that ruling we are sort of “where we are now. That said, the funding for expert witnesses for these proceedings have been and continue to be paid in part by Arkansas Take Action (ATA), founded by Lorri Davis, Echols wife. The major celebrity fundraisers and contributors to West Memphis Three via ATA cite “Paradise Lost” as the impetus for their personal advocacy and sponsorship. I can’t say that I would have blamed them then, as it was not until the series aired, and the “slant” of innocence of the accused by the producers became known to the prosecution and the families, and all but one family member of one of the victim’s declined participation in its sequel. Naturally my first reaction to various organizations, including ATA post conviction fund raising for the defense of 3 convicted murders was a violation of the son of Sam law. Not in Arkansas. A convict can use funds raised on its behalf for its defense. Let’s hope recently elected Senator David Burnett, the former judge on this case has amending that law on his action item list this year. 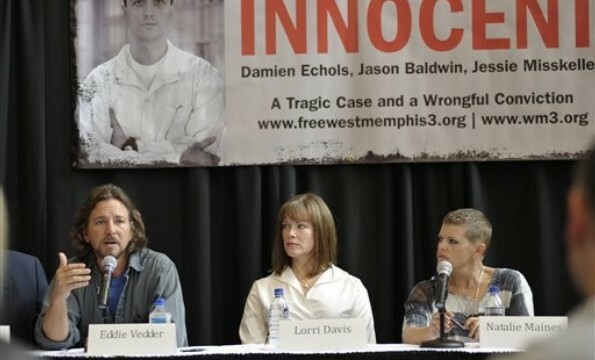 Last November, In response to a united appeal decision by the Arkansas supreme court, previously denied by the circuit court in 2007 and argued by famed attorney Dennis Riordon on behalf of Echols, Baldwin and Misskelley, the west Memphis three were granted a new evidentiary hearing to take place on December 5, 2011 based on further DNA, fiber and hair analysis. It is the goal of the defense team to use the hearing to win a new trial. Last month, the case status update reports new DNA findings exclude all three suspects. There are 2 spots on a victim’s shoe that are the profile of a common unidentified male, and another spot with a different male profile. It is the defense’s position that this exonerates Echols, Baldwin and Miskelley, because it does not belong to them, which was stated similarly in just about every news article as well. It does nothing of the kind, as there were over a dozen WMPD personnel on scene who could absolutely be the origin of the DNA. The defense claims it is “not their job as a defense team” to establish whose DNA it is. While that is true, presenting that evidence as exculpatory has already been addressed by the court on it’s own merit. Consideration by the court of this evidence, and all other evidence whether presented at trial or not is in effect, giving the state the power to decide guilt or innocence and makes the rule 37 “ruling” moot. 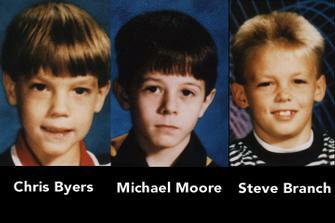 West Memphis, AR- On May 5, 1993, three 8 year old best buds were brutally murdered and submerged in a drainage ditch in West Memphis, AR. Stevie Branch, J. Michael Moore and Chris Byers were located the next day; beaten, hogtied, and worse. On June 3, 1993, Damien Echols, Jesse Misskelley and Jason Baldwin were arrested for all three murders. Damien Echols is on death row, Baldwin and Misskelley received life sentences. 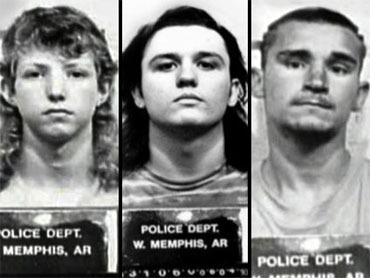 In a four part series, presented by www.blinkoncrime.com’s investigative team, new prosecution evidence is uncovered in the case against The West Memphis Three.